For REGISTRATION please CONTACT US! Several years ago, we created a strategic partnership with our associates in the Danube Region. The idea was to begin a Permanent Program in connection with the Danube River and support the creation of a new generation of young travelers, journalists, and artists, with different approaches to traveling, journalism, and art. After many meetings with potential partners, in the summer 2015, MEC sponsored its pilot Danube Peace Boat E.U.R.O.P.E. Project. That successfully tested the basic elements of the Program, new possibilities for future development and the sustainability of the creative, interactive, online and innovative Modules for the young people we hope to serve. 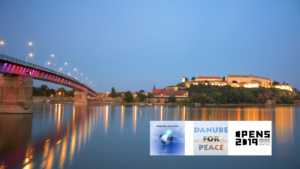 DANUBE FOR PEACE: DIGITAL, INFORMATION, MEDIA, AND PEACE ACADEMY 2019 will focus on innovative, strategic and permanent, creative and educational partnerships and networking. This year, MEC will implement many of the positive results from previous projects. Danube for Peace will involve CS organizations, schools, Rotary, Rotaract, Interact and educational institutions, primarily from the Balkans and Danube Region – and we remain open to new partnerships from NGOs in the Western Balkans, South East Europe and other countries throughout the World. In 2019, we have invited Mr. Patrick Sciarratta, President of the Vinculum Foundation (vnclm.org) in New York and Chair, Media for the Planning Committee of the upcoming 68th Annual United Nations Civil Society Conference. Mr. Sciarratta created and led the famous Youth Assembly at the United Nations from its inception through 2015; he is currently Editor of the NGO Reporter, which is disseminated by the UN to 5,000 NGOs formally-associated with the UN, on a quarterly basis. Working in educational environments of all categories, Danube Waves Media and Art Academy produces lively, vibrant films and videos that celebrate best practices, great teaching, innovation, and promote the highest pedagogical standards and reform. Our work is designed to start and nudge conversations, explain and advocate for the best ideas in media literacy education, critical thinking, and global learning. Traveling as a tool for Regional Promotion, Social Inclusion, Reconciliation and Peace, Intercultural and Interfaith Dialogue, and Mutual Understanding through Cooperation. & Global Citizenship Education, a Hallmark of all Danube for Peace trips!